Create an OAuth 2.0 client ID Set the application type to Web application. 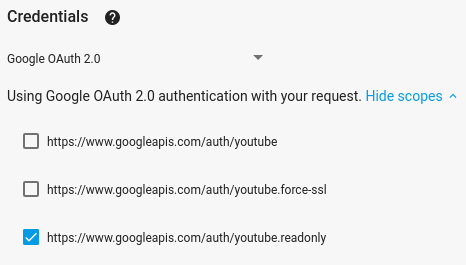 You need to use OAuth 2.0 credentials for requests that require user authorization. For example, you need user authorization to retrieve information about the currently authenticated user's YouTube channel. Copy the code sample and save it in a file named example.html. Open the example.html file in your browser. Also open the browser's developer tools, such as the "Developer Tools" in the Chrome browser. Click the execute button to send the API request. The developer's console should then display the API response. In the code, find the YOUR_CLIENT_ID string and replace it with the client ID that you created in step 1 of this quickstart. Go to http://localhost:8000/example.html file in your browser. Open the browser's developer tools, such as the "Developer Tools" in the Chrome browser. If you grant the permission, the developer's console should display messages indicating that sign-in was successful and that the API client loaded.